Naturally caffeine free. 4 calories per cup. Sugar free.All Natural Ingredients* *All our herbs are gently steamed, the process is gentle to protect their delicate taste. Spring into action and feel the splash of cool water on your face. Embrace the invigorating freedom and lightness that continues throughout your day. What does it taste like? 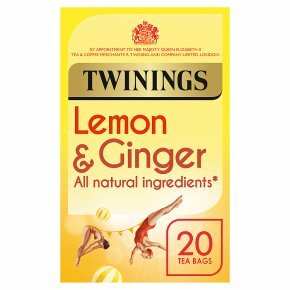 To create this sunny and invigorating infusion, we have blended two of the world's best loved ingredients; spicy, warming ginger with the bright, zesty taste of lemons.